In the early stages of developing an app, you should determine the path you want users to take through your app to do each task. (The tasks are things like placing an order or browsing content.) 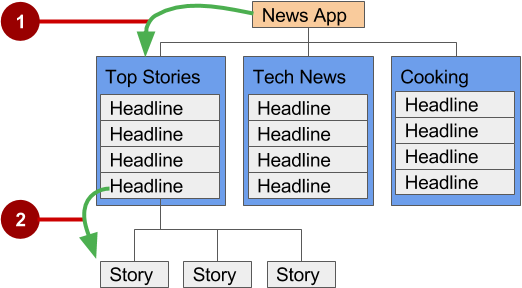 Each path enables users to navigate across, into, and out of the tasks and pieces of content within the app. Back navigation, where users navigate to the previous screen using the Back button. Hierarchical navigation, where users navigate through a hierarchy of screens. 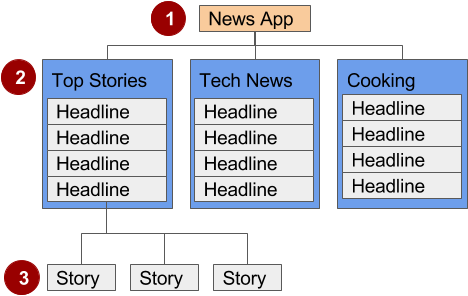 The hierarchy is organized with a parent screen for every set of child screens. 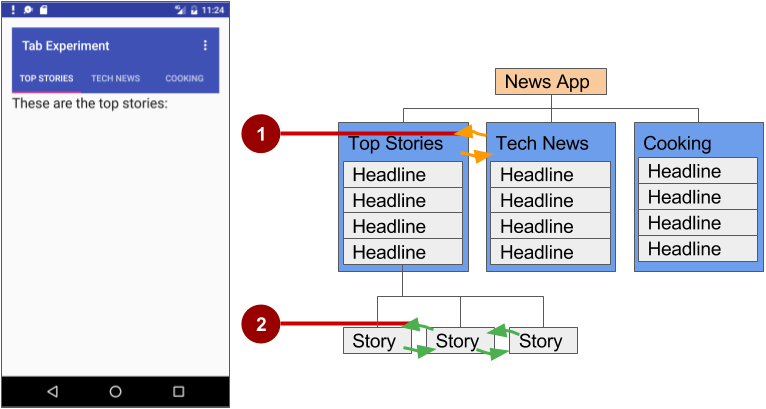 A parent screen (such as a news app&apos;s home screen) enables navigation down to child screens. Siblings are screens in the same position in the hierarchy that share the same parent screen (like brothers and sisters). 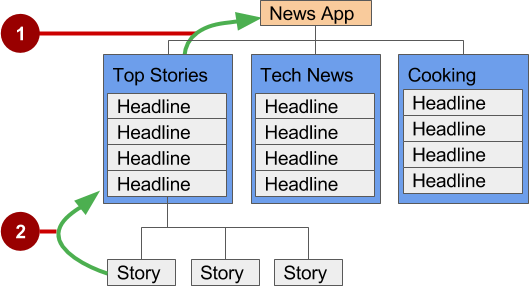 In news apps and others that offer multiple levels of information, the second level of child screen siblings might offer content, such as stories. Implement each second-level child screen sibling as another Activity or Fragment. You can use the main Activity of the app as a parent screen, and then add an Activity or Fragment for each child screen. If the first-level child screen siblings have another level of child screens under them, you should implement each first-level screen as an activity, so that the lifecycle of each screen is managed properly before calling any second-level child screens. For example, in the figure above, the parent screen is most likely the main activity. An app&apos;s main activity (usually MainActivity.java) is typically the parent screen for all other screens in your app. You implement a navigation pattern in the main activity to enable the user to go to another activity or fragment. For example, you can implement navigation using an Intent that starts an Activity. If the child screen siblings do not have another level of child screens under them, you can define each one as a Fragment, which represents a behavior or portion of a UI within in an activity. 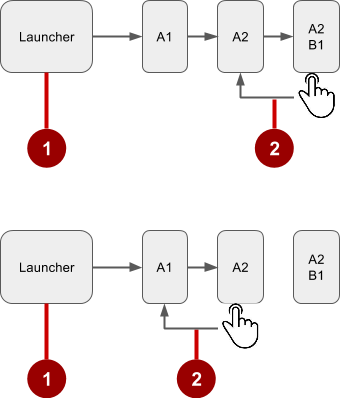 Think of a fragment as a modular section of an activity which has its own lifecycle, receives its own input events, and which you can add or remove while the activity is running. You can add more than one fragment in a single activity. For example, in a section sibling screen showing a news story and implemented as an Activity, you might have a child screen for a video clip implemented as a Fragment. You would implement a way for the user to navigate to the video clip Fragment, and then back to the Activity that shows the story. Tip: The Back button below the screen differs from the Up button. The Back button provides navigation to whatever screen you viewed previously. If you have several children screens that the user can navigate through using a lateral navigation pattern (as described later in this chapter), the Back button would send the user back to the previous child screen, not to the parent screen. Use an Up button if you want to provide ancestral navigation from a child screen back to the parent screen. For more information about Up navigation, see Providing Up Navigation. See the concept chapter on menus and pickers for details on how to implement the app bar. The snippet above in AndroidManifest.xml declares the parent for the child screen OrderActivity to be MainActivity. 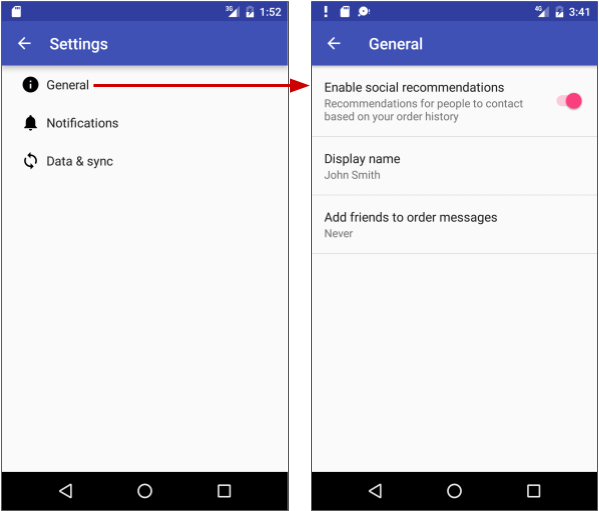 It also sets the android:label to a title for the Activity screen to be "Order Activity". The child screen now includes the Up button in the app bar (highlighted in the figure below), which the user can tap to navigate back to the parent screen. A good example of a navigation drawer is in the Gmail app, which provides access to the inbox, labeled email folders, and settings. 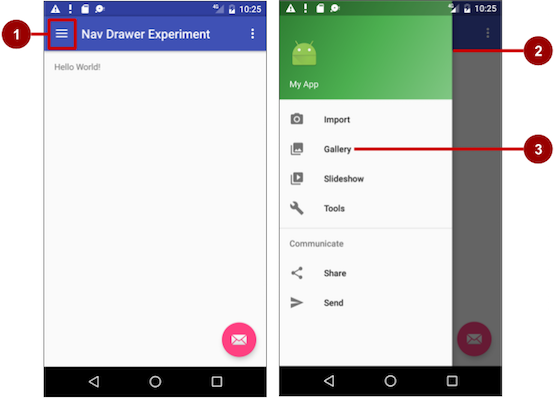 The best practice for employing a navigation drawer is to provide descendant navigation from the parent Activity to all of the other child screens in an app. It can display many navigation targets at once—for example, it can contain buttons (like a dashboard), tabs, or a list of items (like the Gmail drawer). To add a navigation drawer, use a DrawerLayout as the root ViewGroup of your Activity layout. Inside the DrawerLayout, add one View that contains the main content for the screen (your primary layout when the drawer is hidden) and another View, typically a NavigationView, that contains the contents of the navigation drawer. 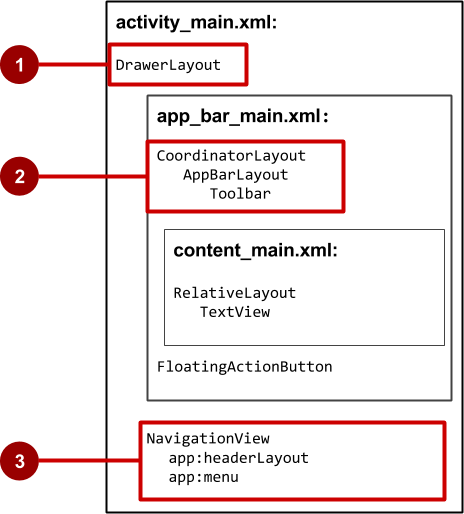 A DrawerLayout as the root of the Activity layout in activity_main.xml. DrawerLayout is the root ViewGroup of the Activity layout. The included app_bar_main.xml uses a CoordinatorLayout as its root, and defines the app bar layout with a Toolbar which will include the navigation icon to open the drawer. The android:id for the DrawerLayout is drawer_layout. You will use this id to instantiate a drawer object in your code. Use the android:fitsSystemWindows="true" attribute to set the padding of the DrawerLayout and the NavigationView to ensure the contents don&apos;t overlay the system windows. DrawerLayout uses fitsSystemWindows as a sign that it needs to inset its children (such as the main content ViewGroup), but still draw the top status bar background in that space. As a result, the navigation drawer appears to be overlapping, but not obscuring, the translucent top status bar. The insets you get from fitsSystemWindows will be correct on all platform versions to ensure that your content does not overlap with system-provided UI components. The NavigationView specifies the layout for the header of the navigation drawer with the attribute app:headerLayout="@layout/nav_header_main". The nav_header_main.xml file defines the layout of this header to include an ImageView and a TextView, which is typical for a navigation drawer, but you could also include other View elements. The include tag in the activity_main.xml layout file includes the app_bar_main.xml layout file, which uses a CoordinatorLayout as its root. The app_bar_main.xml file defines the app bar layout with the Toolbar class as shown previously in the chapter about menus and pickers. It also defines a floating action button, and uses an include tag to include the content_main.xml layout. The app_bar_main.xml layout uses a CoordinatorLayout as its root, and includes the content_main.xml layout. The app_bar_main.xml layout uses the android:fitsSystemWindows="true" attribute to set the padding of the app bar to ensure that it doesn&apos;t overlay the system windows such as the status bar. The content_main.xml layout must be the first child in the DrawerLayout because the drawer must be on top of the content. In our layout above, the content_main.xm layout is included in the app_bar_main.xml layout, which is the first child. The content_main.xml layout uses a RelativeLayout ViewGroup set to match the parent view&apos;s width and height, because it represents the entire UI when the navigation drawer is hidden. The layout behavior for the RelativeLayout is set to the string resource @string/appbar_scrolling_view_behavior, which controls the scrolling behavior of the screen in relation to the app bar at the top. The AppBarLayout.ScrollingViewBehavior class defines this behavior. View elements that scroll vertically should use this behavior, because it supports nested scrolling to automatically scroll any AppBarLayout siblings. The menu items are defined in the activity_main_drawer.xml file, which is located under app > res > menu in the Project > Android pane. The <group></group> tag defines a menu group—a collection of items that share traits, such as whether they are visible, enabled, or checkable. A group must contain one or more <item></> elements and be a child of a <menu> element, as shown below. 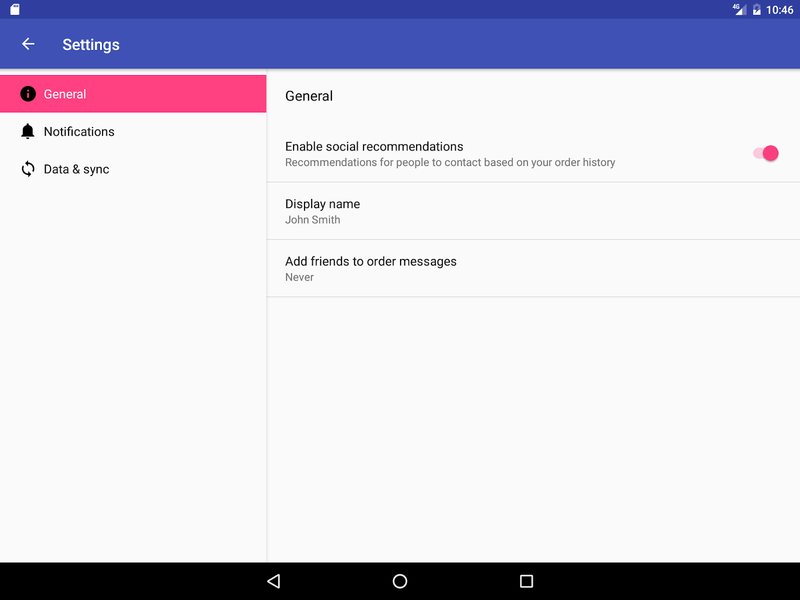 In addition to defining each menu item&apos;s title with the android:title attribute, the file also defines each menu item&apos;s icon with the android:icon attribute. single: Only one item from the group can be selected. Use for radio buttons. all: All items can be selected. Use for checkboxes. none: No items can be selected. This interface offers the onNavigationItemSelected() method, which is called when an item in the navigation drawer menu item is tapped. As you enter OnNavigationItemSelectedListener, the red light bulb appears on the left margin. Click the light bulb, choose Implement methods, and choose the onNavigationItemSelected(item:MenuItem):boolean method. The code above instantiates an ActionBarDrawerToggle, which substitutes a special drawable for the Up button in the app bar, and links the Activity to the DrawerLayout. The special drawable appears as a "hamburger" navigation icon when the drawer is closed, and animates into an arrow as the drawer opens. Tip: You can customize the animated toggle by defining the drawerArrowStyle in your ActionBar theme. For more detailed information about the ActionBar theme, see Adding the App Bar in the Android Developer documentation. The code above implements addDrawerListener() to listen for drawer open and close events, so that when the user taps custom drawable button, the navigation drawer slides out. You must also use the syncState() method of ActionBarDrawerToggle to synchronize the state of the drawer indicator. The synchronization must occur after the DrawerLayout instance state has been restored, and any other time when the state may have diverged in such a way that the ActionBarDrawerToggle was not notified. The code above ends by setting a listener, setNavigationItemSelectedListener(), to the navigation drawer to listen for item clicks. Use a scrolling list, such as a RecyclerView, to provide navigation targets for descendant navigation. Vertically scrolling lists are often used for a screen that lists stories, with each list item acting as a button to each story. For more visual or media-rich content items such as photos or videos, you may want to use a horizontally scrolling list (also known as a carousel). These UI elements are good for presenting items in a collection (for example, a list of news stories). You learn about RecyclerView in another chapter. Use an intent to starts an activity that represents the detail screen. For more information about intents, see Intents and Intent Filters in the Android developer documentation. When adding a Settings Activity, extend PreferenceActivity to create a two-pane master/detail layout to support large screens. Replace the activity content with a Settings Fragment. This is a useful pattern if you have multiple groups of settings and need to support tablet-sized screens as well as smartphones. You learn about the Settings activity and PreferenceActivity in another chapter. For more information about using fragments, see Fragments in the Android developer documentation. Smartphones are best suited for displaying one screen at a time—for example a master screen (on the left side of the figure below) and a detail screen (on the right side of the figure below). The app bar typically contains the options menu, which is most often used for navigation patterns for descendant navigation. It may also contain an Up button for ancestral navigation, a nav icon for opening a navigation drawer, and a filter icon to filter page views. You learn how to set up the options menu and the app bar in another chapter. You can implement lateral navigation with tabs that represent each screen. Tabs appear across the top of a screen, as shown on the left side of the figure above, providing navigation to other screens. 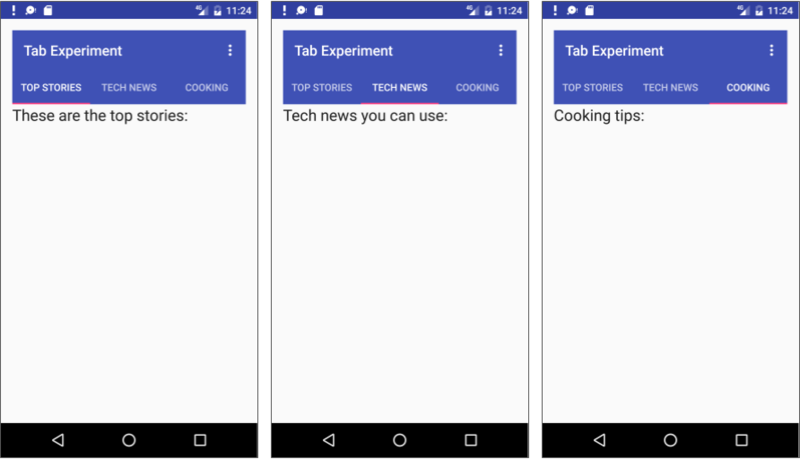 Tab navigation is a common solution for lateral navigation from one child screen to another child screen that is a sibling—in the same position in the hierarchy and sharing the same parent screen. Because there is a single, initially selected tab, users already have access to that tab&apos;s content from the parent screen without any further navigation. Define the tab layout. The main class used for displaying tabs is TabLayout. It provides a horizontal layout to display tabs. You can show the tabs below the app bar. Implement a Fragment for each tab content screen. A Fragment is a behavior or a portion of a UI within an Activity. It&apos;s like a mini-Activity within the main Activity, with its own lifecycle. One benefit of using a Fragment for each tabbed content is that you can isolate the code for managing the tabbed content inside the Fragment. To learn about Fragment, see Fragments in the API Guide. Add a pager adapter. Use the PagerAdapter class to populate "pages" (screens) inside of a ViewPager, which is a layout manager that lets the user flip left and right through screens of data. You supply an implementation of a PagerAdapter to generate the screens that the View shows. ViewPager is most often used in conjunction with Fragment, which is a convenient way to supply and manage the lifecycle of each screen. Create an instance of the tab layout, and set the text for each tab. Use PagerAdapter to manage screens ("pages"). Each screen is represented by its own Fragment. Set a listener to determine which tab is tapped. FragmentStatePagerAdapter: Designed for paging across a collection of screens (pages) for which the number of screens is undetermined. It destroys each Fragment as the user navigates to another screen, minimizing memory usage. For each child view, create a layout for each Fragment such as tab_fragment1.xml, tab_fragment2.xml, and so on. A Fragment is a behavior or a portion of a UI within an Activity. It&apos;s like a mini-Activity within the main Activity, with its own lifecycle. To learn about Fragment, see Fragments in the API Guide. Define the number of tabs. Use the getItem() method of the Adapter class to determine which tab is clicked. Use a switch case block to return the screen (page) to show based on which tab is clicked. ViewPager is a layout manager that lets the user flip left and right through "pages" (screens) of content. ViewPager is most often used in conjunction with Fragment, which is a convenient way to supply and manage the lifecycle of each "page". ViewPager also provides the ability to swipe "pages" horizontally. The related practical is 4.4: User navigation.